""What the World Will Look Like When All the Water Leaves Us "is a lovely, remarkable book, full of people who strive mightily to believe in things--Bigfoot, the Lochness and Lake Michigan monsters, a tunnel leading to the other side of the world, husbands, wives, lovers, parents--they shouldn't. 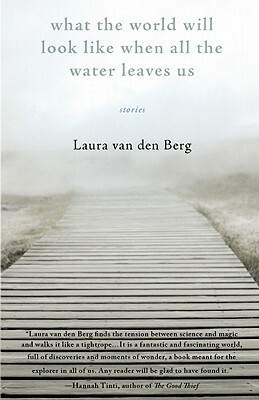 But Laura van den Berg lets her characters believe, and believes in them, and makes us believe, and care, too. Calm, wry, and compassionate, somehow all at once, this book is impossible to resist, and I'd bet big money that we'll be talking about Laura van den Berg and her fiction for years to come." - Brock Clarke, author of "An Arsonist's Guide to Writers' Homes in New England"
"In her first collection Laura van den Berg creates a series of remarkable characters each of whom is striking out for territory unknown, plunging into an uncharted sea. I love the exhilarating sense of adventure in these stories, how they make the world seem larger, and how van den Berg maps our familiar pains in strikingly new ways. "What The World Will Look Like When All The Water Leaves Us "is a dazzling and original debut." - Margot Livesey, author of "The House on Fortune Street "and "Eva Moves the Furniture"
"There is a special kind of magic in the writing of Laura van den Berg, a damp-eyed sorceress who blends the mythological with the everyday, buoyant playfulness with lacerating sadness. Each sentence reads like a beautiful bruise smeared across pages as pale as the bodies that so often strip off their clothes and tangle together in these tender, elegant stories." - Benjamin Percy, author of "Refresh, Refresh "and "The Language of Elk "
"Discussions about debuts often allude to promise, as if to imply that better things will come, but in this particular case, there's no need to wait. Laura van den Berg's talents are already fully formed, and spectacular. This collection has searing emotions, a technical virtuosity, and a lyrical ferocity that dazzle us with undeniable force. Breathtakingly, we follow her characters as they seek escape in far-flung locales, both real and imagined, searching for that rarest of species--the feeling that they belong." - Don Lee, author of "Wrack and Ruin" and "Yellow"
"Laura van den Berg finds the tension between science and magic and walks it like a tightrope. . . . It is a fantastic and fascinating world, full of discoveries and moments of wonder, a book meant for the explorer in all of us." --Hannah Tinti, author of "The Good Thief"
Containing work reprinted in Best Non-Required Reading 2008, Best New American Voices 2010, and The Pushcart Prizes 2010, the stories in Laura van den Berg's rich and inventive debut illuminate the intersection of the mythic and the mundane. A failed actress takes a job as a Bigfoot inpersonator. A bontanist seeking a rare flower crosses path with a group of men hunting the Loch Ness Monster. A disillusioned missionary in Africa grapples with grief and a growing obsession with a creature rumored to live in the forest of the Congo. And in the title story, a young woman traveling with her scientist mother in Madagascar confronts her burgeoning sexuality and her dream of becoming a long-distance swimmer. Rendered with precision and longing, the women who narrate these starkly beautiful stories are consumed with searching -- for absolution, for solace, for the flash of extraordinary in the ordinary that will forever alter their lives. Laura van den Berg was raised in Florida and earned her MFA at Emerson College. She is the recipient of scholarships from the Bread Loaf Writers' Conference and the winner of the 2007 Dzanc Prize. Her fiction has appeared in The Indiana Review, The Literary Review, American Short Fiction, One Story, StoryQuarterly, and The Best American Nonrequired Reading 2008.